During the 1920s and '30s Siebe Bouma, then a young designer on the Public Works payroll, was able to set his stamp on the Groningen cityscape. This placed him in a position not unlike that of Dudok in Hilversum. During this period Bouma designed bridges, a string of distributing substations, a timber pavilion on Noorderplantsoen reminiscent of Oud's celebrated Site Office, street furniture, housing projects (the most famous being the Bloemenbuurt) and the Public Works building. 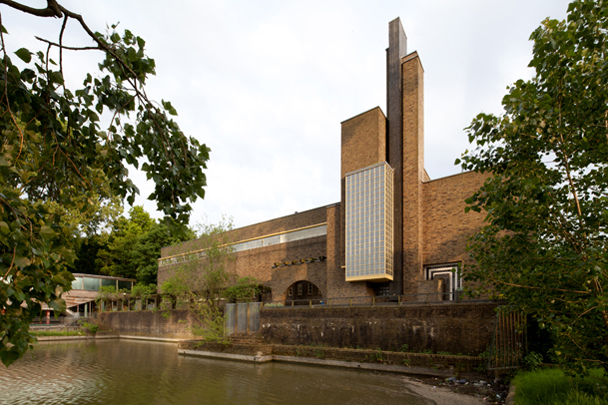 The most interesting architecturally, however, is a series of six primary schools he built between 1925 and 1932. A coincidence of events - the 1922 Primary Education Act, a reviving economy and the attendant added momentum in building residential estates - led to a great many primary schools being built during this period. The series of designs Bouma made saw his architecture develop from a local variant on the Amsterdam School to a cubic-geometric style deriving from Dudok whom he admired. The first building in fact houses two institutions, the Scheepstra School and the Van Starckenborg School. This architecture is still unmistakably Amsterdam School, its sculptural brickwork and curved forms presided over by a tiled roof. The second, the combined Leonard Springer and Mulock Houwer Schools, is a particularly potent design whose dominating central section follows the axis of Westinghousestraat. The entrances to the two schools are left and right of the semicircular centralized extension containing the shared gymnasium, its introverted brickwork topped by an expanse of steel-framed glass. The next schools illustrate the move towards an increasing abstraction. If the basic set-up of the combined Th. Thijssen and D. Bos Schools and the annexe on Rabenhauptstraat is still Amsterdam School, the details, particularly the chimney, betray the influence of Frank Lloyd Wright. The two final schools built by Bouma, the Van Houten School and De Zonnebloem Infants' School, are the most mature in design and mark his arrival at an expressive cubic architecture.